Report on "CONNECTIVITY AS A METHOD? - The Future of Biennales and Triennales" is now available. 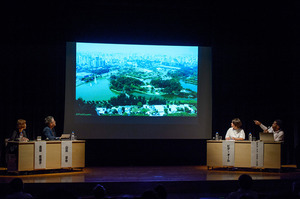 The Organizing Committee for Yokohama Triennale and Agency for Cultural Affairs co-organized the international seminar titled “CONNECTIVITY AS A METHOD? - The Future of Biennales and Triennales" at Yokohama Museum of Art on Wednesday, September 27, 2017. The seminar took place in conjunction with Yokohama Triennale 2017 and the General Assembly of the IBA (International Biennial Association) to be held in Yokohama. Report on "CONNECTIVITY AS A METHOD? - The Future of Biennales and Triennales"
Copyright © 2019 Yokohama Triennale. All Rights Reserved.